First a very short but pertinent remark: I am going to polish the fine art of writing short reviews. Don’t expect long elaborates from now on… and, of course, any reactions, positive and negative ones, will be more than welcome! So. Those petals… It was a good book not only because it was able to surprise me more than once. The narration was very nice and smooth, the characters interesting enough to be worth following around and the setting… who wouldn’t like to visit Victorian London, I ask? At least for a while? Still, I had a strong impression this book was far too long. Really. About one-two hundred pages I would gladly remove from the novel without any adverse effect (and I am thinking here about the paperback edition, 835 pages long). Then came the ending and once again it seemed to me that the author got tired of the story (and small wonder, with so many pages…) and wanted to tuck all ends and tie all threads very quickly. The effects were unimpressive. A novel for those who have a lot of time and love Victorians. Perfect for a long trip – like several days long. If the ending makes you as disgruntled as I was you can always throw it away through the window. 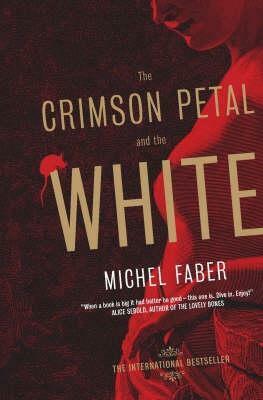 This entry was posted in book review, historically-flavoured, literary fiction, romance, suspence and tagged hard to categorize, michel faber, prostitution, the crimson petal and the white, too long, Victorian London. Bookmark the permalink. Thank you very much, my lady Blodeuedd! Kuddos to making it short especially with a book of this size. Oh, Anna Karenina is an epic, I know. I had to skip some chapters as well.